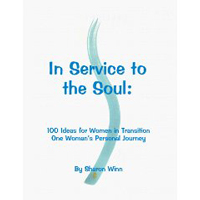 Sharon Winn is the author of In Service to the Soul: 100 Ideas for Women in Transition (1999), a guide for women that addresses the spiritual, emotional, and physical dimensions of midlife transitions. Jerilyn Brusseas, inventor of the Cinabon, says about the book: "It is delicious. I am crazy about it. It is a cool spring like water. Your writing is so authentic. The way you put words together is incredible. Hardly ever have words been more authentic to me."